In my old house, I wanted to get more natural light into my kitchen. 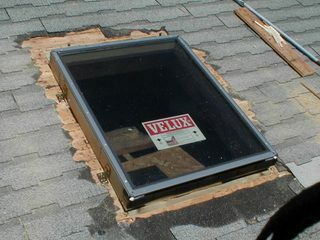 So back in '99, I decided to install a skylight. I had just bought a digital camera before that, so I took photos of every step. My house was a 1950's style bungalow - from the days before roof trusses were used. The roof was rather interesting in that it had no supports across its width, as you can see from the image at left. Because I was going to cut a hole into the roof on one side, and even cut off one of the rafters, I decided to reinforce the roof structure to catch the load that any cut-off rafter might no longer support. I added some extra 2x4's to support the ridge of the roof in the area that I would cut away. I added these to the rafter that I would cut out, plus one to the rafter on either side, for good measure. 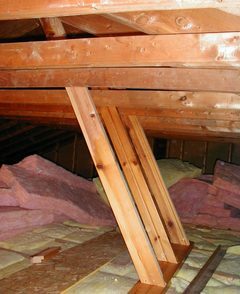 The 2x4's are supported by the ceiling joists just above a supporting wall below. 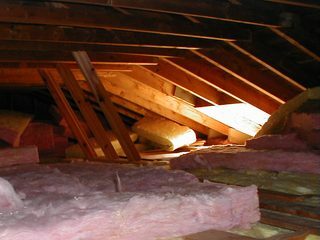 I had to do this work early in the morning, before it got too hot in the attic to work in there. With the extra framing done, it was time to cut a hole in the roof. To make sure I'd got the right spot on the outside, I drove a nail through the sheathing from the inside, so that I could see where it was on the outside. The next step was to remove the shingles in the area. A shovel (the kind used for digging soil) works best for removing shingles. After that, I cut the roof sheathing with a circular saw. I have seen suggestions that one cut the whole roof and shingles with a circular saw, but that would be really messy, and I didn't have a spare saw blade to ruin for the job either. 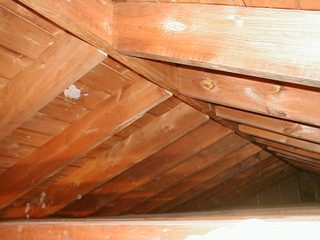 I also wanted to see the lines of nails on the roof, to help me guide the saw along side, but not through the rafters. Once I had the hole cut, I cut out the middle rafter with a bow saw (the kind used for pruning trees), because I could get closer to the edge with it than with the circular saw. After that, I nailed a piece of 2x6 across the top and bottom of the opening, to hold the cut off rafters on either side. 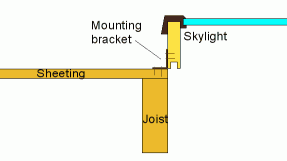 The skylight itself mounts with these little metal angle bracket that are screwed into the side of the skylight and onto the roof. 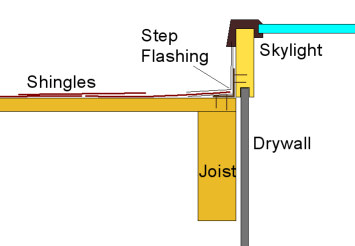 The skylight itself is just the right width to fit between two rafters. 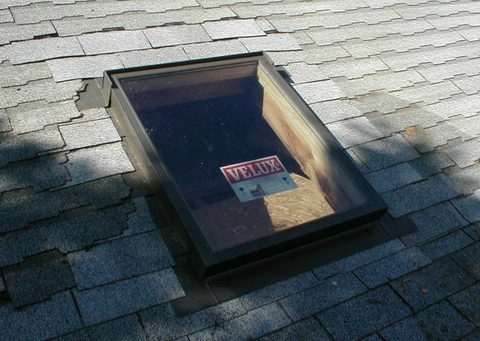 Skylights sizes are such that they all fit just between two rafters for various standard rafter spacings. 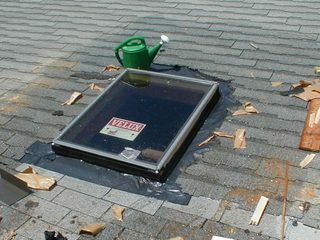 I installed a waterproof membrane around the skylight, just for good measure, and then installed the flashing and shingles. 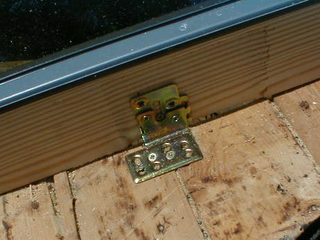 The step flashing goes under and over the shingles. 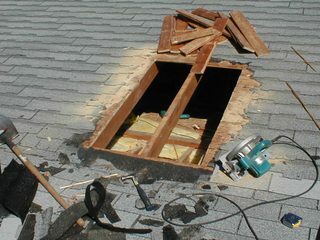 with each row of shingles, a piece of step flashing is put over the previous shingle right where the next shingle will go. That way, the step flashings will guide any water that might make it around the shingle back above the next shingle as it flows down the roof. A rather clever system, really. As I was installing the flashing and shingles, the day was getting warmer. To work with shingles, its best if they are not too cold, and not too hot. But a sunny summer day is much warmer than ideal, so I wetted the shingles to cool the area I was working on down a little bit. 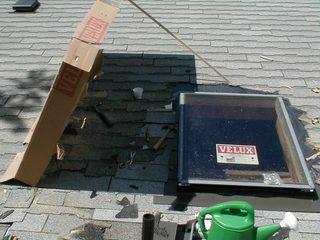 Later, I even used part of the box that the skylight came in to provide some shade. I used some new shingles, which I slipped in between the existing shingles on the sides, and below a row of shingles two rows above the skylight. That way, the area nearest the skylight was new shingles. With the skylight all mounted in the roof, I could leave it be for a while. In fact, it was not until several weeks after I installed the skylight on the roof that I even cut a hole in the kitchen ceiling below the skylight.